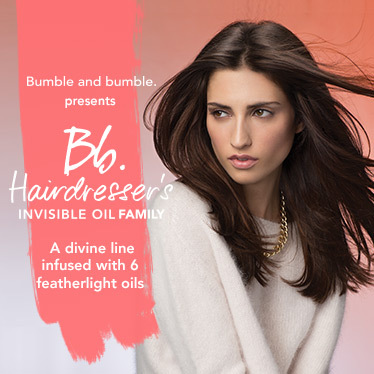 Hairdresser’s Invisible Oil has been a favorite in the Bumble and bumble. loyal community for sometime. But now its even better! Bumble and bumble. just formulated an entire product line using everything you love about the original product! We were so excited for the launch this week. The bright packaging is a show stopper. You can find the whole product line at Meridian Salon: Hairdressers Invisible Oil Sulfate Free Shampoo, Hairdresser’s Invisible Oil Conditioner and Hairdressers Invisible Oil Heat / UV Protective Primer along with the original oil formula that started it all. The adorable travel bag contains the three new products in travel-ready sizes. Hairdressers Invisible Oil Heat / UV Protective Primer: This UV and heat protective pre-styler prepares the hair for styling. It softens, detangles, de-frizzes and tames those pesky flyaways. Eases styling by protecting against breakage, heat styling, and UV damage. On damp or dry hair, before styling comb or brush through and style.